Monday night, the “UndocuBus,” with dozens of monarch butterflies painted on its side, sat in a parking lot in front of Skandalos, a Mexican restaurant/performance venue on the outskirts of Charlotte, displaying its slogan to any late-night passersby: "No Papers, No Fear." Inside the club, Los Jornaleros del Norte (Day Laborers of the North) played cumbia tunes to the undocumented immigrants who have been traveling the country on the bus. Los Jornaleros are aptly named. The band members met on a street corner where they waited to be picked up and employed for the day, and started playing instruments together as a way to pass the time. Standing on a corner waiting for work has become much more dangerous in the age of Arizona’s SB 1070 “Papers Please” immigration law, and its legislative cousins throughout the country. What recourse do the country’s 117,000 day laborers have against harassment, brutality and wage theft? One is a stay-at-home mom of three. Another is a construction worker. One is a student who hopes to attend graduate school for math and economics. All of them risked deportation to demand greater rights for undocumented immigrants. Three weeks into their historic "No Papers No Fear Ride for Justice," Phoenix resident Leticia Ramirez carries a message for other undocumented mothers across the United States. "I am mother and I am undocumented and I am not afraid," Ramirez, a mother of three young children, told me in a phone interview today, as the 30-plus modern-day freedom riders entered Georgia, on the heels of the 11th Circuit Court's strike down of that state's Arizona copycat immigration. "I have heard so many stories from other mothers," Ramirez said, an 18-year resident of Arizona, who was brought to the United States from Mexico as a child. "They are inspired by our journey, and tell me that they have been inspired to come out of the shadows, and this encourages me to keep going." They pushed us out. We came back stronger. They let us in. As we began the early morning drive to Alabama from Tennessee, we all felt nervous. This was our first action in Alabama, the only state to have harsher laws than Arizona. Knowing that people with power were inside, we thought that maybe we had a big chance to get arrested. When we do actions in Arizona, we have a lot of community behind us. Here, we thought it would not be the same. El grupo de personas integrantes de La Jornada por La Justicia: Sin Papeles y Sin Miedo visitaron a inmigrantes sin documentos viviendo en Nueva Orleans. Durante la mañana del 9 de Agosto una delegación de mujeres de Arizona y Alabama visitó al alguacil Marlin Gusman. Leticia es una madre y activista de Arizona quien tiene las siguientes reflexiones sobre el evento. El Jueves 9 de agosto del 2012 comenzamos el dia con una visita al Sheriff de Nueva Orleans, Marlin Gusman, para apoyar a una madre de familia que fue arrestada y detenida. Conocí a Deliny Palencia, la madre que menciono, durante nuestra visita con el Congreso de Jornaleros, y nos conto su historia. In six weeks I will arrive in Charlotte accompanied by a full bus of other undocumented people, after visiting with immigrant communities who face discrimination, supporting their efforts to affirm their dignity and no longer be afraid. We’ll come to Charlotte where we hope the president will be inspired by our example of courage. He has shown that he has the power to relieve our suffering. We’re doing what we must for our children to have better lives and for those of us who have lived in the shadows to finally be included fully in this country. We hope those who have the power to make that happen will do more to make it real. By voluntarily risking arrest and being placed in Sheriff Arpaio's jail, the undocumented Arizonans confronted what had previously been their greatest fear and demonstrated that everyone is safer as part of organized communities prepared to defend their rights and prevent their violation. The four will announce their participation in a national 'No Papers No Fear Ride for Justice' at a press conference this morning. 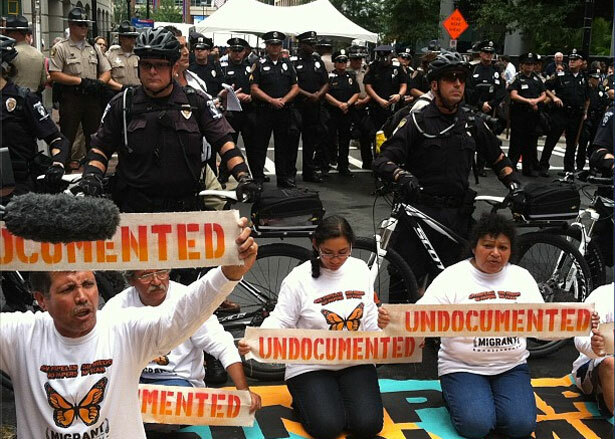 Undocumented migrants will board a bus in Phoenix, Arizona and publicly travel to hot spots of Arizona copy-cats and anti-immigrant sentiment to come out as unafraid, support local organizing, and challenge proponents of hate. The journey will end in Charlotte, North Carolina at the Democratic National Convention. I've decided I can't be afraid any more, to fight for my community and my family and against all the laws and against what Arpaio is doing to our community. That's why I've decided to be arrested in our struggle for our community and my family.